Stone Installation Clamp - Reach It! - Move It! - Crush It! With the hydraulic installation clamp you can lay paving stones quickly and efficiently. 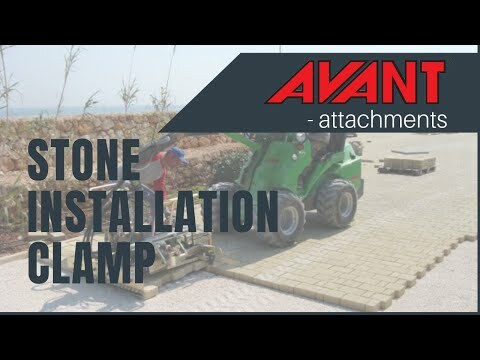 The installation clamp takes a whole layer of paving stones directly from a pallet, which can then be lifted on to the area to be paved. The hydraulic installation clamp is equipped with: ATTENTION! Requires attachment control switch pack A34700on the loader. this way the cocking of the blocks can be avoided and a lot of time is saved, becauseone doesn’t have to reposition the blocks by hand. Avant jib boom (A32395) is alsorequired, for lifting and handling of the clamp. ATTENTION! Requires attachment control switch pack A34700on the loader.